The Desert Oak grows slowly in its first years, appearing to linger in an extended adolescence. Beneath the surface the tap root furiously seeks the water table. Sometime in the late 1940's, Alison Hunt was born in the small mission community of Areyonga. While the country traditionally belonged to the Malbunka family, it became a refuge for displaced Pitjantjatjara people. Alison's mother had walked there with her mother, father and sister from the South-West Petermann Ranges, many hundreds of kilometres away. As she gave birth to Alison, her mother died, in the bush, under a tree. In accordance with law & custom she was buried quickly and her parents walked back to their tribal lands. The baby was left with extended family to be raised. In that time of terrible upheaval for Aboriginal people, the sadness could not be borne by the family to whom the baby had been entrusted. They had neither food nor clothes. Beyond that their grief for the dead mother was too deep. In Aboriginal culture they were too "sorry". Alison explained to me that "sorry" is more than grief. Aboriginal people become disorientated and emotionally helpless in the face of death. It might be that in a society that lacks a notion of individualism, death kills part of the clan itself, leaving the family in state of living death. In any case they asked Wilfred Swift, a Western Aranda man who was working in the Areyonga mission store as a Lutheran evangelist, to adopt the child. Wilfred's wife, Lucy Malbunka Swift, was happy to accept the baby and Alison was raised as a Western Aranda woman. At the age of 12 Alison was told the story of her birth. 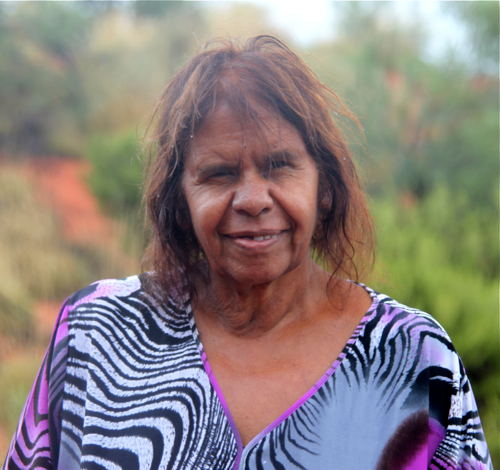 She had always wondered why the Pitjantjatjara mobs at Areyonga had called out to her. "Pitja nuna na la kutu" ... "Come over here to us". When the child was adopted there was a traditional contract agreed upon that one day she would return to her birth mother's family to be told the stories of her country. To become a Pitjantjatjara woman. As Alison explains this contract was beyond a promise. It was the deepest of obligations that went to the heart of Aboriginal spirituality, for people to "know" their country. Wilfred was a strong man. He spoke English, Pitjantjatjara and Western Aranda [and understood a little German] and acted as a liason officer between both white and black tribes, translating not only the words spoken but placing them into a cultural context that people could understand. This was the time of the forced removals. Children disappeared, never to be seen again. "Never get in that whitefella's car" was a constant warning to the children. Wilfred told the white authorities that this child was being brought up well and none of his children must ever be taken away. With his adopted child he had the extra obligation that she would one day return to her blood family. Alison grew up watching her father speak confidently to white men. When her adopted father and mother died she left for her mother's country and learnt the stories. In obedience to the original arrangement she visited her mother's birthplace. In Aboriginal society Alison has dual nationality, she is both a Pitjantjatjara and Western Aranda woman. Like her father she remains neutral in politics lest everyone gets lost in division. She has sat on the board of the Central Land Council and Uluru-Kata Tjuta National Park. She speaks her mind as confidently as her father spoke his. I have watched Aboriginal people around white authority figures and witnessed the change in character. Deep down and with good reason, there is a fear of what we are capable of. Alison, like her father, holds her ground. As strong as she is, Alison is a gentle soul. Like most of the "nanas" her main concern is for her grandchildren. I call her often, ironically to complain about whitefella bureaucrats. Experience has taught her the futility of outrage and she brings me gently back to earth like a kite in trouble. Alison's English is perfect yet she can neither read nor write. She has never told the story of her childhood to a whitefella before. I, and you, are privileged. Ultimately Alison is a teacher and I believe a great spiritual leader. You do find them out here in the desert. As she spoke about Wilfred and Lucy the old woman broke down, "I wouldn't be here if it wasn't for them", tears flowing up as from a tap root deep in the earth. and grows tall in the desert with limbs that whistle in the wind. PS. Alison would welcome a conversation with you. She believes that "we need to open the door .... to embrace and welcome one another." Post a comment or ask a question and I shall read them to Alison. It might be that we use this forum to develop a culturally appropriate conversation between white and black women. PSS. Alison runs trips for women south-west of Uluru with other traditional senior elders. If you would like to participate just call her mobile - 0427 522 743. She would welcome your contact. Privileged�indeed Raymond. Thanks. You have a great ability to swing between the extremes of great hilarity and sobering eloquence. Wow. You are a fabulous conduit and communicator Raymond. For a city slicker like me, you provide a means of connecting with wonderful people like Alison, as well as an opportunity to learn a little of her story. Thank you. gorgeous tale illustrated witht he mental vsion of our rich country. I too would love to join one of her women's trips. What a rich story,and and so important for us as whitefellas to hear it. For sure I will phone Alison. Hi Rae.. great.. That is ultimately what is needed. Thanks for that. Lets start TALKING. Alison reminds me of my own mother. Very little formal education but with a wisdom and knowledge about people and life that can not be learnt from books and that I deeply respect. Mum went to school for "six years and one winter" and, due to her father's death, had to help look after 10 siblings and a farm when she was only 14 years old. It took many years and emigration before I really understood, but when I finally did understand I came to the conclusion that my mother had what I would call 'calibre'. So to me, women like Alison are also 'women with calibre'. When one has a closer look we have much more in common than we at first may think. Links and bridges have always been there, it is just that some people felt the need to put gates and barbed wire across the roadway.Have a great day!Cecilia. Wonderful. Thank you Alison for sharing one of your stories with us and Raymond for posting it. Where did the beautiful quote about the Desert Oak come from? It is a great privilege to be in the presence of an extraordinary woman and a man who is willing to let his heroine speak so profoundly - thank you. Thanks Raymond for introducing Alison and her story to me. I also remember Mavis from the 2009 Desert Writers trip, with great affection and respect. I have long thought that instead of religious indoctrination in our schools we should have to study Aboriginal cultural and spiritual beliefs and history. Thank you Alison for sharing your story and Raymond for writing it so powerfully. I know a little of your beautiful country and people Alison, after walking the Ilpurla last year - one of the highlights was hearing about womens' business from Mavis on the first afternoon. Sometime I hope to join you on one of your trips. Thanks for sharing Alison's story. We are all interconnected and need to hear these stories so we can know more about the different families and the places they belonged to. Thank you so much for providing this opportunity. Working in Mutitjulu, I had the pleasure of meeting Alison before coming across this article. From the moment I spoke to her, I knew she had something special in her. I feel very privileged to have met her. I had the pleasure of meeting Alison in Melbourne recently. Her spirit, kindness and gentleness was humbling. I would love to make contact with her as I bring groups to Uluru. Thank You for sharing her story.